First some preliminaries. I’m about to seal a flexible tube onto the top to protect the electrical cables. You can also see the wind generator frame hanging in the foreground. This will be hung in the rigging when extra power is needed. 7 knots according to a trawler skipper. The river was running fast and carrying lots of sticks and clumps of weed and rubbish. Every few minutes there’d be a unnerving scraping along the hull as a pile of flotsam bumps along the waterline. 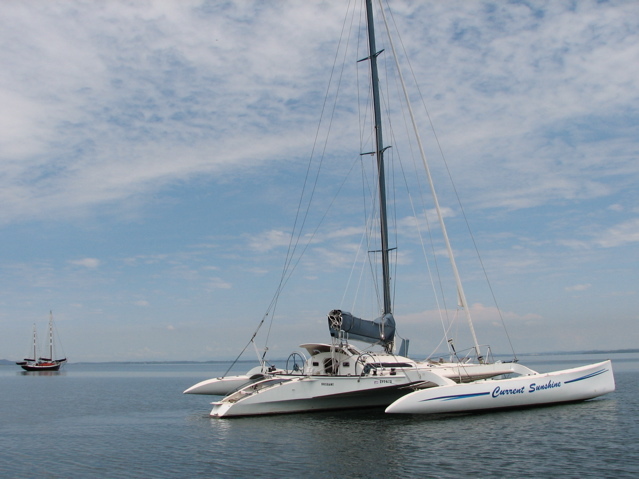 What’s it doing to that fresh antifouling paint? I’m worried that a large log will come floating along and not be able to fit between the hulls. I decide to stay on watch just in case. High tide is about 10 pm, and the riving is peaking about the same time. Moonlight turns the river to a mercurial flow that reaches out across the cow paddock. By 4am the tide is now low, and the river flow is decreased a little, and the cow paddock has appeared again. The current is not as strong and I’m not so worried about logs doing any damage – so I sleep. 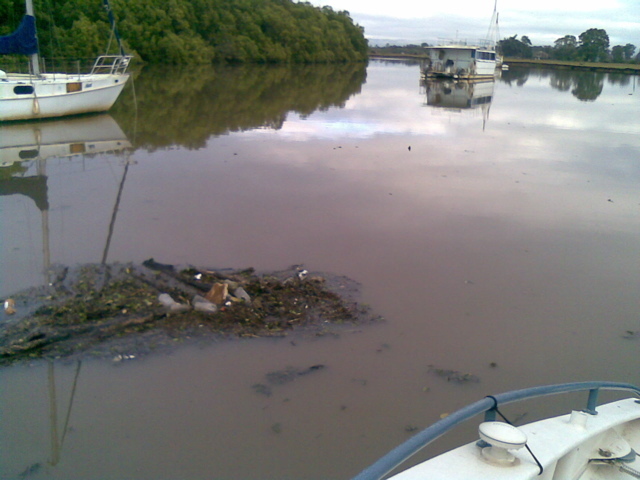 Here’s a photo of the river the next day at slack tide. There’s a small pile of flotsam nearby and the nearby sailing boat was anchored further upstream and got dragged down to here. In this position she can swing on Current Sunshine so I want to get it moved to a better position. 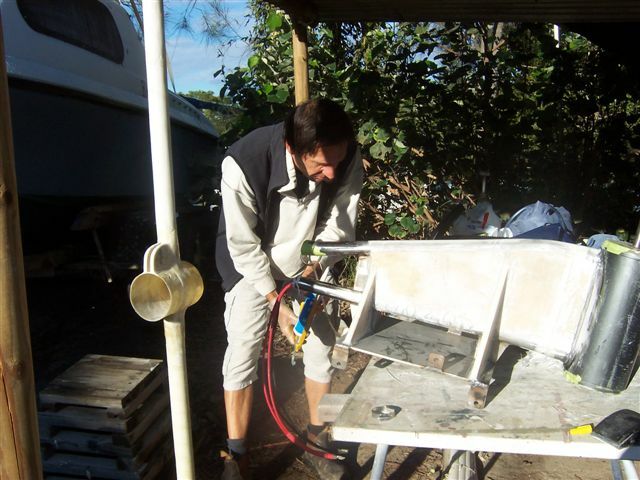 A few days later and the river is now back to normal and I’m working on the fairing for the motor. It will be done in a few days. I took a some more photos on my phone but dropped in the river and so the photos are gone too. I have a new phone with the same number. A severe weather warning is current for the SE coast district. A few showers, increasing to rain periods. Moderate to fresh SE winds. Nice weather for painting huh. This is how its been for the last five days – just for the days I’d hoped to prepare and paint the bottom. 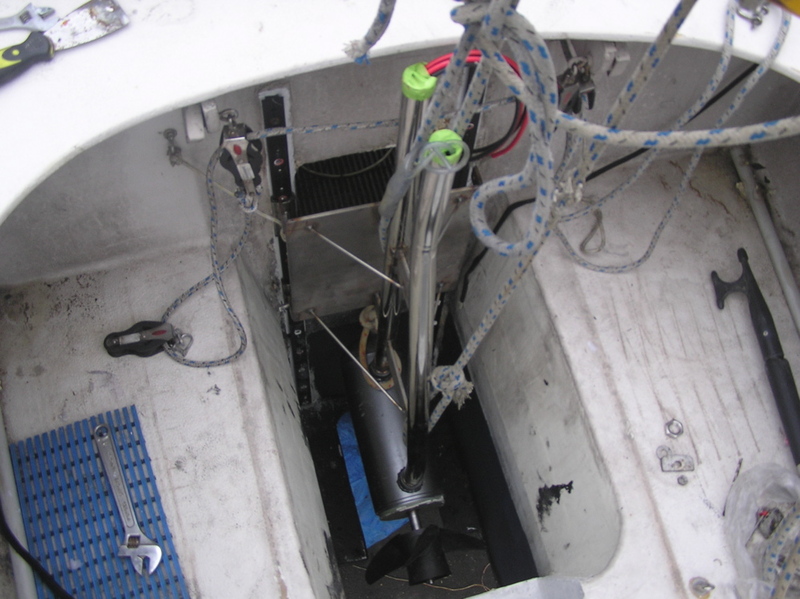 Back on Tuesday I had three days to do the bottom and get a trial install of the motor done – Current Sunshine was due back in the water on Saturday 6am. Hardly possible – so I enlisted help for sanding and painting from Col – a guy who had a boat here at Monties but had some time available. That would allow me to fit the tracks for the motor, and install the motor to test how it fits and to trim the pipes. Here’s a picture of Col on Thursday night under rain and lights. The white stripes are the water dripping down from the rain. Just after this the rain increased to a torrential downpour and we abandoned it for the night. 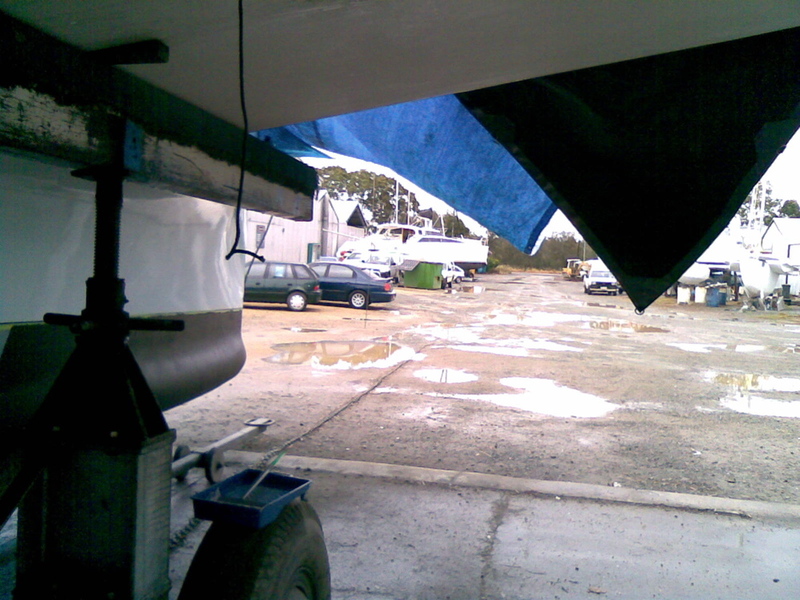 Here’s a shot of the boatyard during the day – during a lull in the rain – looking out from under the tarps over her bows. The upside of the severe weather is that the boat due to be hauled out on Saturday couldn’t get here and so I got a reprieve – Current Sunshine could stay out until Monday morning. This is the extra time we needed and with help from Deb the antifouling paint is done. Otherwise she would have gone back in unfinished! So she’s now due back in tomorrow about 8am. 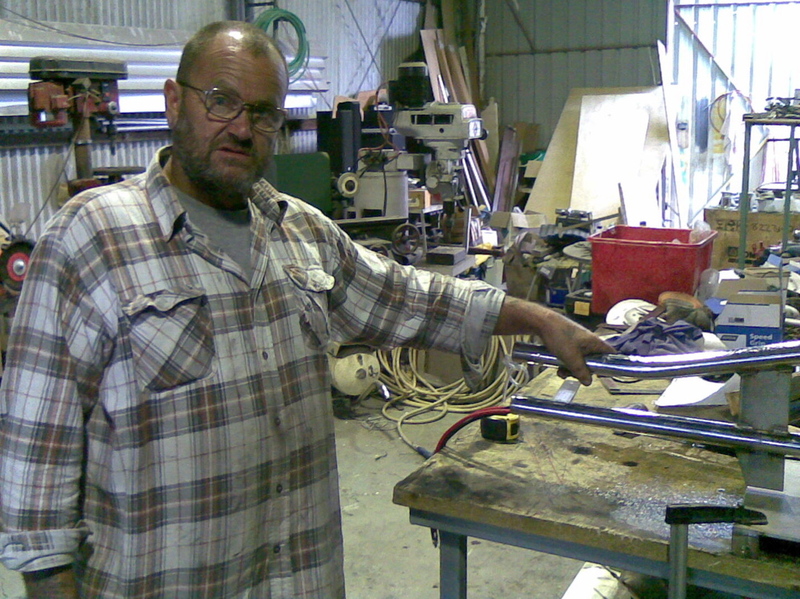 Meanwhile Mark has been fabricating the stainless steel work for the motor. 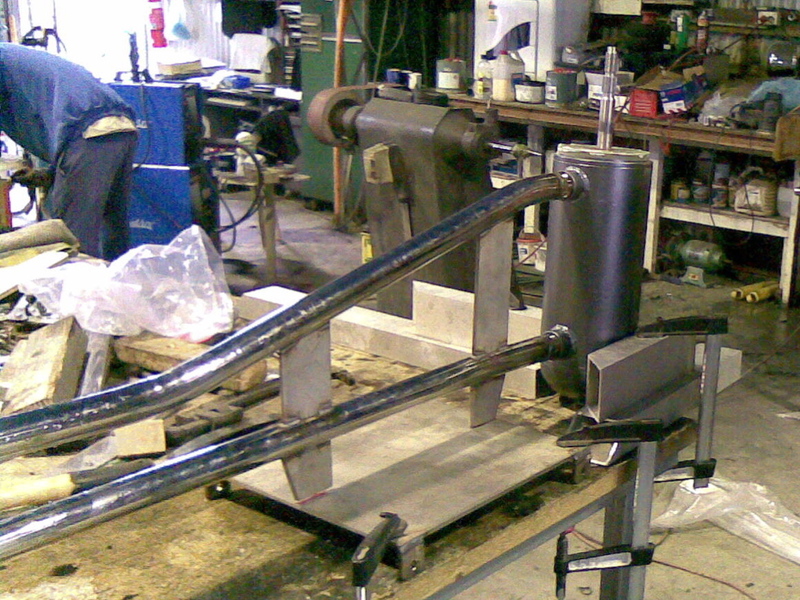 Here’s a shot in his workshop showing the motor with some S-S tubes added. And here’s mark explaining how he protected the electric cables during the welding process..
And trial fitting in the well to check how the new carrier fits and it positioning..